Everyone is online, and on social media. All. The. Time. Those days of being excited about going to work on Cyber Monday to slyly shop for gifts because you didn’t have Internet at home are long gone. 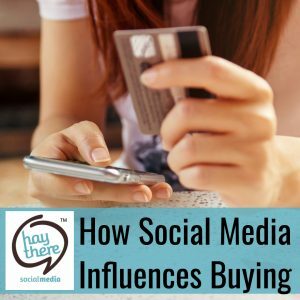 That’s why if you’re not promoting your products on social media, you’re missing out on a large market that spreads faster than word of mouth – because not only will people see your product, but they’ll be able to instantly purchase it! We’ve all been there. That one person (or maybe several) on your holiday shopping list who you just have NO idea what to get. You wander around the stores aimlessly hoping something grabs your eye. You search online through specific categories on Amazon – but there’s a plethora of options so you become overwhelmed…and give up. Then, you jump over to Facebook to see what everyone is up to. Lo and behold, the PERFECT gift for that certain someone scrolls through your newsfeed. It could be a piece of unique jewelry, a shirt with a funny saying on it, or maybe a new piece of tech gear that you haven’t seen before. You click on the link, which takes you to the company’s website. You read about the item – and see it’s on sale. Score! While you’re there, you browse around that website a little more and find some other things that will make great gifts for a few other loved ones. Click. Buy. Gifts purchased. Thank you, social media marketing, for making it easy to finish that holiday shopping! How many times are you on social media each day? Gone are the days of scouring sale ads, or setting aside an entire weekend afternoon to hit the mall and shop for gifts. Instead, you can shop on your phone, tablet or laptop while you’re taking a break at work, eating lunch, or taking a few minutes to yourself after the kids get to bed. Maybe you ask for recommendations on social media and friends drop suggestions. Or, better yet, maybe the gift recipient tags you and draws your attention to gift ideas. Either way, social media makes buying gifts that much easier because you don’t have to make any special effort. It’s just kind of already there. Oh, and guess what? That perfect gift that scrolled through your newsfeed was a likely sponsored ad – either one that just appeared for you, or one that a friend shared. And it worked, didn’t it? If you’re a company selling a product, narrowing options down for the consumer can help you sell more items because it eliminates the hassle of browsing. The next time you see a sponsored ad for a specialty T-shirt or sparkly baubles, open the post and check out the comments. See how many people have tagged their friends to share it with them. That’s social media marketing at its best. The good part about marketing on social media is that you don’t have to make a commercial and hope your target audience sees it. Let Hay There Social Media help you promote your product to the right people, interact with customers, increase sales and track the results.